Yesterday’s signals were not triggered, as there was no bearish price action at 1.2369. Short entry following a bearish price action reversal on the H1 time frame immediately upon the next touch of 1.2436 or 1.2459. 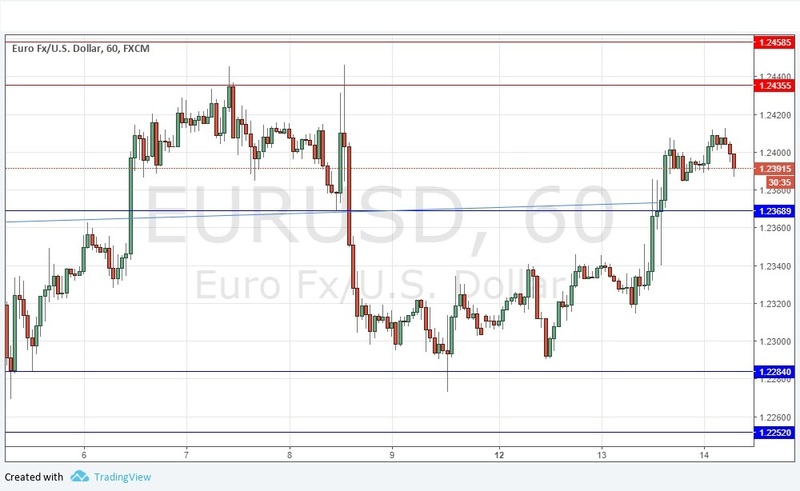 Go long following a bullish price action reversal on the H1 time frame immediately upon the next touch of 1.2369. I wrote yesterday that I was maintaining a mildly bullish bias, in line with the long-term bullish trend. This paid off as the price rose reasonably well and broke above the former resistance level at 1.2369 and trend line. The price has remained above that level and has not even retested it yet from the other side. If the price does retrace there, its reaction should tell us something about the likelihood of getting a major continuation of this move. The current price action during the Asian session is suggesting a pull-back is quite possible over the course of today, but the picture still basically looks bullish, so I maintain my bullish bias today. However, I note that the area of resistance that begins at about 1.2436 and stretches up to 1.2500 has been historically strong and could act as an effective cap on any continuing bullish movement. Concerning the EUR, the President of the European Central Bank will be speaking at 8am London time. Regarding the USD, there will be a release of Retail Sales and PPI data at 12:30pm, followed later by Crude Oil Inventories at 2:30pm.